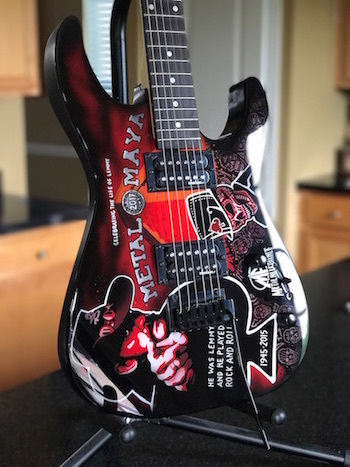 Metal Maya has announced two special tribute sets by heavy metal all star band Metal Allegiance, as well as additional details about the previously announced Metal Maya / Metal Allegiance promotional giveaway. Metal Maya—a 4-day all-inclusive heavy metal destination festival vacation from October 29-November 2 at the luxurious Now Sapphire Riviera Cancun, just south of Cancun on Mexico's Yucatan Peninsula—features over a dozen bands, led by Anthrax, Hatebreed, Overkill, and Superjoint (with Philip Anselmo). 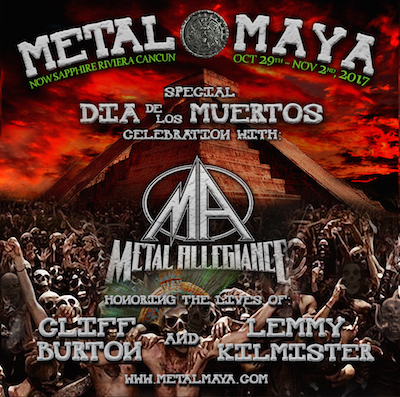 Metal Allegiance founder Mark Menghi says, "We couldn't come to Mexico during Día de los Muertos and not honor such a sacred event ourselves. Lemmy and Cliff were the first two to come to mind. They were both major influences in not only our lives and careers, but millions of others' as well. We played our first Metal Allegiance show on Motörhead's Motörboat, and will be forever grateful to the man. These two were and will forever be legends. Metal Maya is in for some really killer moments!" Metal Allegiance guest performer Kyle Sanders of Hellyeah adds, "Pretty damn honored and excited about joining my boys in Metal Allegiance down in Mexico for Metal Maya! Couldn't think of a better place for tacos and metal! Cheers!!" The Metal Allegiance lineup for Metal Maya includes: Mike Portnoy (Metal Allegiance/The Winery Dogs), Alex Skolnick (Testament), David Ellefson (Megadeth), Mark Menghi, Phil Demmel (Machine Head), Kyle Sanders (Hellyeah), Gary Holt (Slayer/Exodus), Mark Osegueda (Death Angel), Steve "Zetro" Souza (Exodus) and Ryan Waste (Municipal Waste), plus special surprise guests. The overall Metal Maya music lineup is as follows: Anthrax, Hatebreed, Overkill, Superjoint (with Philip Anselmo), heavy metal all-star band Metal Allegiance, Death Angel, Whitechapel, Crowbar, Prong, KYNG, Otep, Tim "Ripper" Owens, and ONI. Metal Maya will be hosted by SiriusXM's Jose Mangin, and Lamb Of God's Chris Adler will be on hand as a special event host. Guests will enjoy festive celebrations on both Halloween (October 31) and the traditional Mexican Día de los Muertos (November 1), when guests are encouraged to dress up in calaca (skull) masks and sugar skull makeup.